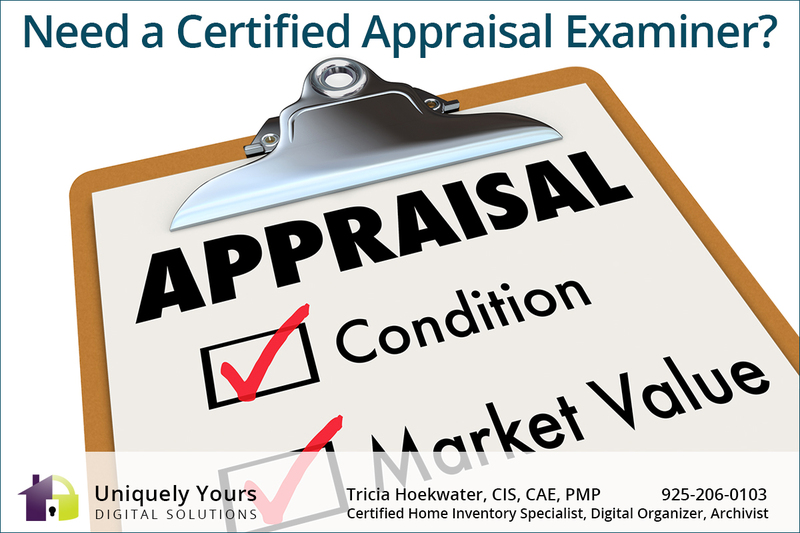 TRICIA IS A CERTIFIED APPRAISAL EXAMINER: Information recorded for a home inventory is similar, if not the same, as documenting items for an appraisal. Therefore, I found that including appraisal services is a huge benefit for my clients. Many utilize home and business inventory services, then seek an appraiser to determine the value of their luxury items, artwork, collectibles, etc. This results in the client being required to schedule another appointment and then incur additional costs because the same information will be collected twice. By utilizing my Appraisal Examiner service, you will benefit by working with someone you know. You will only need to schedule one appointment for both your inventory and appraisal services, and have both professional reports completed within the same time frame. Catastrophe can happen in an instant. Take care of yourself…and what you have! Get a certified appraisal today. Contact Tricia via phone at 925-206-0103 or by email: uniquelyyours@outlook.com to schedule your appraisal today.